This can also be called the h2o2 battery, oxygen battery, peroxide battery, or 1776 battery. Please see my post on noble metal batteries before trying to understand this post. 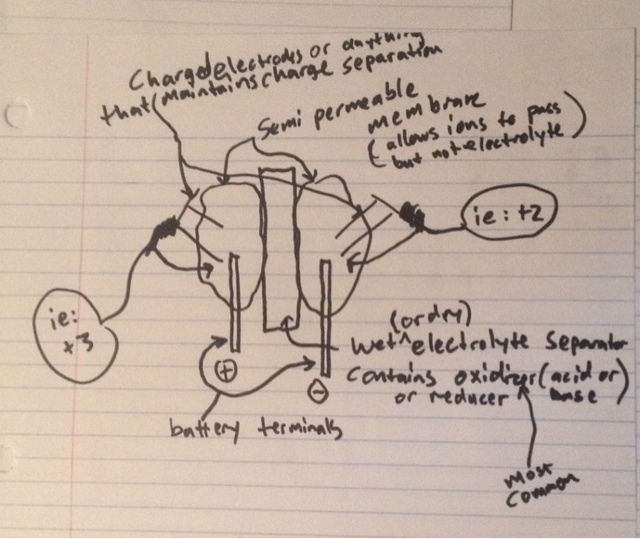 This open source invention is a type of noble metal battery termed the "electrum battery". It can be pure silver up to primarily gold. The only requirement is silver be present. Gold can be fully or partially substituted for platinum, palladium, or any other noble metal. It uses advanced chemistry and bio-chemistry to make the most reliable and powerful battery to date. Electrum is a mixture of gold and silver. Silver has a oxidation reaction of 0.7996 volts. This means that silver is oxidative and it takes a pretty oxidizing environment to oxidize it. Oxygen has a oxidation reaction of 0.695 volts which means it is almost able to oxidize silver. This is perfect. So in our battery oxygen is the electrolyte and silver the anode. There is a solvent and there is pressurized oxygen to keep oxygen dissolved in the solvent. When a current is drawn on the battery it pushes the oxidation forward and the oxygen is able to oxidize the silver in the presence of acid. This acid can be anything that can donate H ions. One interesting possibility is using CO2 gas to add the weak acid carbonic acid into the solvent. This could be in the same tank as the oxygen or be at a separate tank to keep each pressure tunable. Now this is all well and good but once the oxygen oxidizes the silver it turns into hydrogen peroxide which is an even stronger oxidizer which would now make the battery discharge even when no current is being drawn. Luckily only 1 mole of h2o2 is produced for each mole of oxygen reacted. So when the current stops, the oxygen can no longer react with the silver (it is below the oxidation requirement) and so the h2o2 generation stops, and the battery is stable. However if we wanted to we could use this h2o2 to do something even more powerful than oxidize more silver. We could make it oxidize gold. Gold has an oxidation reaction of 1.692 volts and h2o2 is 1.776 volts (hence 1776 battery). So if we have gold as a part of the anode we can now not only get out 0.7996 volts from the silver, but 1.692 volts from the gold. This more than doubles our power. This is why it is beneficial to include gold in the anode as an alloy or simply fused together with the silver. There could even be two separate anodes, one gold and one silver and different voltages would come off each. Silver is basically the catalyst to get oxygen to convert to hydrogen peroxide to oxidize gold. This is likely very similar to how animal energy generation takes place; oxygen oxidizes iron (in heme) releasing hydrogen peroxide which oxidizes cobalt (in vitamin B12) which releases much more energy. The cathode can be made out of iridium or preferably tantalum. Niobium may work and tungsten probably won't work. An alloy of these refractory/noble metals is possible as well. This battery should be able to recharge in seconds, it will take as much power as you can throw at it. You can also release the oxygen pressure (and co2 if applicable) which would halt any further oxidation and help the battery recharge faster. As soon as all the gold and silver ions are reattached to the anode, there is no longer anything left in the solvent and so the solvent is no longer conductive, which makes overcharging impossible. So I have been researching batteries and capacitors a lot and have realized one thing: We are bieng lied to. Batteries and capacitors don't work like we are told or what is bieng taught in textbooks. Only 2 things could be happening, either they know how they really work and are feeding us old outdated theories in order to protect battery makers and investors (or other industries like oil over electricity) hegemony or they simply are in the dark and have no clue about how they actually work. I think the answer must be a mix of the two because somethings I can believe they just don't understand but others I think just have to be a blatant lie. I think the way they explain how tantalum capacitors explode if you charge them backwards falls into the blatant lie category. There is just no way they can be this dumb. It would help if I explained exactly how electrolytic capacitors worked first but that is a big topic so I will just introduce it. How do capacitors really work? What is happening as you can see above is the anode is charged positive. The anode is the electrode that get oxidized. In a battery the anode is the material that is preferentially oxidized by the electrolyte. This preferential oxidation is what causes electron release and power generation. In a capacitor we (usually) have two of the same materials so there is no preferential oxidation of one electrode over the other and why capacitors don't generate power on their own. In order to get preferential oxidation we have to apply a different charge on one electrode than another. Now the positively charged electrode will preferentially get oxidized over the negatively charged electrode. This makes sense because electrons are reducing agents so the negatively charged electrode will be reduced and the positively charged will be oxidized. This power generation only exists while the difference of charge lasts, so that is why capacitors energy output exponentially decays while batteries do not. Batteries don't have to maintain an electrical charge to put out power which really makes batteries a superior technology in my mind. The only benefit to capacitors is they use physics (electric charge) as leverage instead of being purely chemical like batteries. So we have the positive electrode being oxidized (anode) in a capacitor and the negative reduced. This is opposite from a battery where the negative electrode is oxidized (anode) and the positive is reduced. What gives? Why are they opposite? Well they really aren't opposite, the anode is being oxidized in both cases BUT when the capacitor is charged that anode now becomes the cathode (positively charged). This is because we positively charge the anode so it gets preferentially oxidized, but while it is getting oxidized it becomes the cathode so we can use it as positive. Alright I know that is kind of confusing but hopefully it clears up some confusion in a lot of minds about how capacitors actually work. So now how does this apply to tantalum capacitors and why you can't charge them backwards? Well if as in a typical capacitor you have 2 of the same electrodes then you could charge it any way you want and it would still work. But tantalum is expensive. Only 1 electrode is tantalum the other is probably something cheaper, lets say copper. Now this is where they lie. They say "oh the electrolyte is the electrode!" How ridiculous! No the metal the electrolyte is touching is the electrode retard. Basic Chemistry 101 don't be stupid. "The oxide layer is the dielectric!" they say. Someone is trying desperately to hold on to the old outdated and blatantly wrong understanding of how capacitors work. Forget "dielectric" that word is meaningless and doesn't apply to how capacitors really work. It is an ancient relic. So what we really have is a tantalum electrode, and a (lets say) copper electrode separated by an electrolyte. Cool. So why doesn't this just work as a battery? We have two different materials right? Right BUT in order for it to work as a battery the electrolyte must be able to oxidize ONE of the metals all by itself. So what they do is choose an electrolyte that oxidizes NEITHER. That way it doesn't act like a battery. Make sense? Now copper is the lightweight of the two and it is more easily oxidized than tantalum. So the copper is charged negative and tantalum is positive. Tantalum is a beast and it can handle the onslaught. As it turns positive the electrolyte oxidizes it and forms the oxide layer. Then when the voltage across the electrodes is released, that oxide layer acts as the cathode (positive) and the copper as the anode (negative) and it generates power like a battery as long as the charge lasts (like all capacitors do). So why can't we charge it in reverse? Well its simple, copper isn't tough enough to get oxidized. Tantalum is the most resistant metal of all (maybe excepting iridium). Since we selected an electrolyte that was strong enough to oxidize tantalum, we can only imagine what it would do to copper if we reversed things. If copper was positively charged and therefore got oxidized it wouldn't form a nice oxide layer like tantalum would, it would get utterly destroyed. A hole will probably form in the copper leaking out oxidizing electrolyte which will start a chain reaction. Or in the case of manganese dioxide/carbon electrode the manganese compound gets further oxidized which oxidizes the carbon and starts it on fire. And that is why you can't charge electrolytic capacitors backwards. I was experimenting with different metals making a battery and I mixed up an electrolyte of hydrogen peroxide and potassium hydroxide. I tested the electrical potential between copper and various other elements. When you have an electrolyte on a separator (like a wet piece of paper) between two metals, the negative side on a volt meter will be the less resistant to the electrolyte and the positive side is the more resistant. Copper (99.9%) beat molybdenum (by 0.4v), vanadium (by 0.1 volts) and nickel (by 0.1 volts) but surprisingly it didn't beat 99.9% iron. Iron had about +0.1 volt potential difference so not much better but if you are choosing between the 2 metals for oxidative alkali resistance, choose iron. So I have laid out new technology for noble metal batteries and ion exchange batteries in my previous posts. Reading those should give you some background into the thought that went into this invention. This invention is based on the observation that some metals, while having a negative potential to go from ion to solid, have a "not so negative" potential. What this means is they just barely can't be recharged by giving them electrons. Well chemistry to the rescue. What if we could give these metals a little "nudge" or "leg up" to get them to recharge? Or even to recharge them without even adding electricity? All without having to make electrodes out of solid non-metal compounds like lead sulfate? Well we can. Originally we have an oxidizing electrolyte. This oxidizes the anode to release cations into solution. For noble rechargeable metals we can apply an external voltage and get the cations to come back and stick back to the anode and viola, the battery is recharged. For other metals we can't do that. So what if we could swap the oxidizing electrolyte for a reducing electrolyte? Then these stubborn ions can be reduced either just from the electrolyte alone or from a combination of the electrolytes effect plus the external applied power. Something like NADPH, or quercetin, or hydrazine, or even just a base in some cases, anything that can reduce or reverse or partially reverse the oxidizing power of the electrolyte. Metals that would be especially good canidates for this would have a small negative electrode potential to reduce them from ions to solids would include lead, tin, nickel, cobalt, etc. Mabye even iron. With a well chosen electrolyte it may be possible to get ANY METAL to reduce back to a solid! So this technique may even be used to get lithium metal to recharge. What could happen is you use up your battery, add reducing agent to the electrolyte, then apply a charge and your batteries are back to full. Then you dump that now "empty" electrolyte (you may be able to save it to use again later) Then add fresh oxidizing electrolyte and you are good to go again to use the battery. This could be called the "blood battery", "bio battery" etc. In my last open source patent I described a noble metal battery which can be maintained in the positive electrode potential range for easy recharging. Well what if we weren't confined to using solid metals? What if we could use charged liquids or even gasses instead? This would make anode selection much easier, we could keep ultimate rechargability while opening up many more element possibilities. The reason for this is there are many reactions for example that reduce a +3 ion to a +2 ion and have a positive electrode potential but cannot easily be fully reduced to a zero charge. So why not make a battery that has for instance a +2 charged electrode and a +3 charged electrode? They already have this to some extent by using compounds like lead sulfate or the like. But what if we could maintain a pure solution of only active components and a solvent and get an ultra long battery life? That is the ion exchange battery. It could even make use of a fluorine reduction and have the potential for almost 3 volts a cell, or probably more practically, a cobalt battery at 1.82 volts per cell. Or of course the iron battery at 0.771 volts. (would be the real "blood battery") And have of course, near infinite cycle life. The charges could be anything where one side is different from the other, I chose +3 and +2 as an example. These could even be made into a true "series" where there are 3 or 4 or more bags, each with one or more charge difference from the other. So in that case for example cobalt could be oxidized from solid to +1, then in another reaction go from +1 to +2, then from +2 to +3, and so on. Those "electrode bags" could be filled with gas or liquid. The semi-permeable membrane would allow active elements to travel through but ideally not allow electrolyte from the separator back into them. The separator doesn't have to be a "thing" it could just be electrolyte between two electrode "bags". I use Bags in quotes because they don't have to be bags, anything that would fulfill the requirements can be used. The solvent in the electrode may or may not flow with the ions. The electrolyte between the bags would oxidize (or reduce, but probably most commonly oxidize) the more reduced ions (in the examples case, the +2) while leaving the +3 ions the same. Many oxidizing acids and bases can achieve this. When ions charge changes, they automatically flow to the other side where their charge is attracted to be. So it would be an ion-exchange process. If the solvent moves with the ions one "bag" would shrink while the other expanded. The "bag" with the lower positive charge (or negative charge since it is relative) would be the negative electrode of the battery and the "bag" with the higher charge would be the positive electrode (terminal) of the battery. This open source patent can be used and/or commercialized by anyone. Please, make money off of this. Why use noble metals? The simple answer to that question is "because they can be recharged". Now that may strike you as odd. No batteries out there use only noble metals yet they recharge right? Right, sort of. They don't charge very well. Lithium battery fires, batteries that only last 10 years and have to be replaced, etc. What we have come to expect as the caveats of batteries aren't inevitable. What if your parents endowed you with a battery when you turned 18 and you could use it daily for the rest of your life? That is the type of battery this technology of noble metal batteries offer. Nearly infinite cycle life. In fact, a noble metal battery will likely grow better over time. How is that possible? Every drain/recharge cycle atoms move away from the anode (the power generating electrode) and back to the anode. Every time atoms leave and are redeposited they grow in a fractal pattern a lot like how dew condenses on a cold window. With a metal the microscopic "droplets" don't combine into water droplets, rather they keep depositing on top of each-other causing a micro or nano structured electrode. Now the voltage is only determined by 3 things; anode material, cathode material, and electrolyte. However the current is determined by the surface area. So your battery (assuming you keep the electrolyte refreshed) will always maintain the same voltage, but the more cycles the battery gets the more current you can draw from it. The total amp hours will stay the same but the rate at which you can use up those amp hours can be greater. So the power available will increase over time. Likely with noble metal batteries the manufacturer would run it though say 1,000 cycles to break it in and increase the power potential. *Tellurium (Te) should also be categorized in nobel metals, Thallium for sure is a noble metal as well. Tin and lead are close but I will categorize them as intermediate metals because of their low negative solidification reduction potential, wheras elements with high negative solidification potentials like silicon, aluminum, and lithium I will categorize as terminal metals. rechargeable technologies? Why do those batteries break yet this one won't? Well to put it simply, they aren't using rechargeable materials. They literally do a hackjob so that their battery can pseudo recharge. (Aside: The NatureHacker mentality isn't about doing "hackjobs" to get things to work. The NatureHacker mentality is about truly digging deep and understanding exactly how nature works so that when we make something, it sings like a fine tuned crystal glass). They combine a few materials like lithium plus iron plus phosphate (all are non rechargeable) and somehow it can kinda recharge. Its kind of a farce when you think about it. Current battery technology is analogous to someone trying to scale the side of a skyscraper to get to the top while someone else (Noble metal battery) just goes inside and takes the elevator. But unless you understand what an elevator is and know what it looks like, you wouldn't know it could solve your problem. So how do we know that noble metals are the only truly rechargeable metals? Well simply looking at the oxidation/reduction potential table. Reforming a solid metal from an ion with a voltage only occurs with noble metals. In other words there is a positive voltage potential. This means when you add electrons to a solution of gold ions, for example, the gold ions will accept the electrons and turn into solid gold. 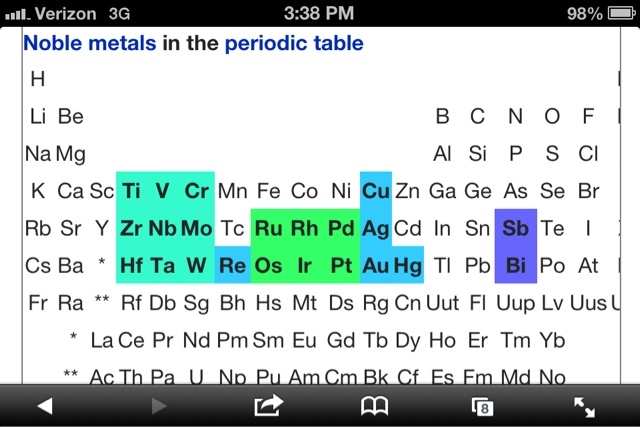 All metals besides noble metals will not do this. Their voltage potential is negative which means the reaction only goes backwards. In other words with other metals they will not simply accept electrons. To reduce these metals most of the time you will need a carbothermic reduction like is the case with aluminum or silicon. These elements make great 1 time use batteries but not rechargeable. 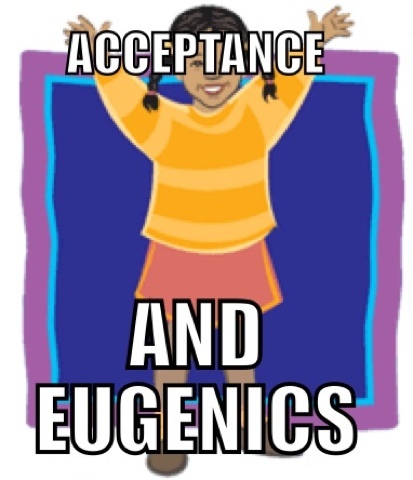 So lets get into the specifics. How do I build this battery? Well the answer is simple, take 2 different noble metals, throw some oxidizing acid between them, and viola, a battery. That is literally it. What I have found works well is using a traditional noble metal like copper, silver, or gold paired with a refractory metal (which are categorized within the noble metals) such as tantalum, molybdenum, vanadium, or tungsten. Copper will give a max of around 0.55 volts, silver will give 0.9 volts, and gold over 1 volt as well as palladium and platinum. Basically the more expensive your battery, the more volts it will produce. My current pick of the moment is a Tantalum/Silver for relatively low cost and decent voltage. You can alloy any of these metals you want as well. Also you can have layers of different metals or alloys to change the voltage potential during discharge or to save money on making a solid electrode out of expensive metal. You could even use the same base metal as both electrodes then have another metal(s) as ions in your electrolyte which will deposit onto one electrode (which ever one you hook up to "negative") while charging. Now we simply have to pick an electrolyte to use. The electrolyte must be capable of dissolving the anode material (copper, silver, gold, palladium, platinum, iridium etc.) but not dissolve the cathode. A battery works by creating a difference, a difference in one metal's ability to be oxidized over the other. If the two metals can be oxidized about just as easy then there will be no voltage. If one is easily oxidized and the other difficult to oxidize then you will get the maximum potential difference (voltage) for that given reaction. Tantalum is supposedly easy to oxidize yet in practice it seems to be the toughest metal because the oxide is totally insoluble. This means once it oxidizes the surface it stops and can no longer be oxidized. This means it can probably even beat iridium, and make a tantalum/iridium battery which would be the highest power ultra rechargeable battery possible. Back to the electrolyte. You can choose any non metal or metaloid or combination thereof for the basis of the electrolyte (including just simply h2o2 by itself (oxygen acid) if the anode metal's oxide is soluble in water like chromium (chromic acid)). Key is it has to be oxidizing so that it can dissolve the anode, and noble metals are pretty hard to dissolve. The simplest solution is nitric acid. I tend to like iodic acid. Iodic acid is made by dissolving iodine metal in water and oxidizing it with hydrogen peroxide. You could also try a hydrochloric acid with h2o2 (but may produce chlorine gas) or pirhanna solution (sulfuric acid and h2o2) phosphoric acid or boric acid or even selenic acid mixed with h2o2. 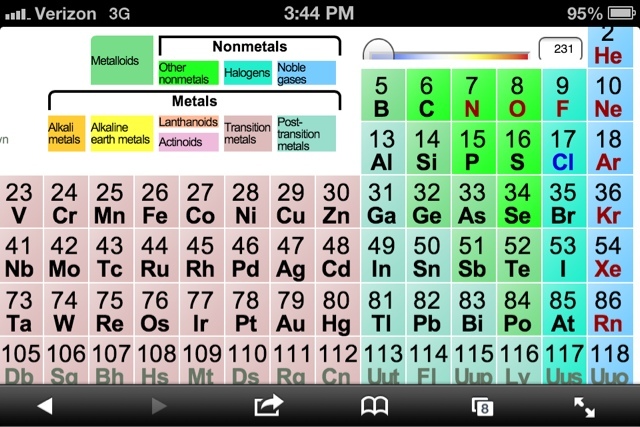 Any non metal or metalloid will work (Maybe including noble gasses? Technology doesn't currently exist to make noble gas acids but possibly in the future?). Anyway that is about it. A nice easy low cost introductory combo could be copper and molybdenum with iodic acid which gives 0.4 volts. Switching to a better cathode like tungsten or tantalum can bring it up to 0.55 volts. Nitric acid could probably be used with a metal better than molybdenum like tantalum or tungsten and get 0.5 volts, but between copper and molybdenum nitric acid only produces 0.2 volts. Have fun, be creative, and improve the planet with green battery technology! His "drug dealer" supposedly came forward. I think this is bunk. I can believe that prince bought drugs for tours and whatnot when he was in LA, but prince lived in minneapolis so I don't believe he was currently recieving drugs from the supposed dealer around the time of his death. The last time "Doctor D" the drug dealer saw prince was in 2008 when he sold him a 6 month supply of drugs. I don't know about you but a 6 mo supply doesn't last 8 years lol. "Doctor D" is debunked. Prince underwent an autopsy to find out his cause of death. The results are not in yet but I have reverse engineered the cause of death with 100% certainty. When I heard about Prince's death I immediately started searching for the circumstances surrounding his death. One article gave clues about how he was looking weak and pale and had several "health scares" recently. Well the only system in the body that causes "health scares" is the cardiovascular system. For you to go from healthy one moment to sick and or unconscious the next is the blood pressure (or blood sugar but he wasn't diabetic). So what could be causing these dramatic swings? Heart function obviously. So I figured his cause of death was heart failure. What type of heart failure? He was only 57 so it would either be hypertrophic cardiomyopathy or dilated cardiomyopathy. Him seen riding his bike furiously through a parking lot would support the hypertrophic cardiomyopathy theory but since he wasn't an athlete there wasn't enough consistent training that would thicken the heart wall. More likely would be dilated cardiomyopathy where the heart is weak and can't contract all the way. I knew that dilated cardiomyopathy can be caused easily by a taurine deficiency and that vegans are very commonly taurine deficient. I searched to see if prince was a vegan, and yes he was. So I am 100% certain he died of cardiomyopathy. Vegans should take taurine supplements to prevent this from happening. After doing lots of alternative energy research and learning about lots of materials, I found something pretty shocking to me. Epoxy, that ultra hard glue that engineers love, is actually composed out of BPA. Bisphenol-A the ultra potent estrogen mimicker blamed for so many negative health effects. Well I figured it wasn't that big of a deal because we aren't exposed to epoxy very much. But a couple days ago I woke up in the morning and had a realization... what if dental fillings (the non-mercury ones) contained epoxy? If they do, they would be made out of BPA and present an unavoidable source of constant BPA leaching! It would all make sense, everyone is either BPA toxic or Mercury toxic, take your pick! I have been struggling with gynocomastia for almost 2 decades now and I can't even remember how my chest used to look normal once upon a time. Well shockingly I was right. BPA makes up at least 1/3 the weight of a composite (non-mercury) filling. Constant leeching in the mouth is probably to blame for gynocomastia and other estrogen related problems, probably even many feminine cancers. The only safe dental material is dental porcelain/ceramic so make SURE to request it. And if you are struggling with estrogen related issues you may want to consider getting your composite fillings removed and replaced with ceramic/porcelain if possible. If you can't eliminate your BPA exposure, support the metabolic pathway called glucuronidation. In this pathway your body creates a sugar called glucuronic acid and attaches it to the hormone and excretes it from the body. Taking Inositol daily roughly a couple grams (glucuronic acid precursor) or glucuronic acid itself daily will help your body detox of this estrogen mimicker. In order to get this ultra important mineral into as many hands as possible I am going to start selling the crown jewels, an extreme concentrated stock solution, the same thing I use to make the selenium bottles I sell here for $8.57 an ounce. Only 12 drops of this solution is required to make an entire ounce bottle that contains a daily value of selenium (333ug) in every drop! This stock solution makes a whopping 50 bottles! That totals out to 30,000 servings of selenium! The idea is this would be used by resellers to really widen the audience that has access to ultra high quality 100% absorbable selenium. Only ultra pure 99.99% selenium is used for unsurpassed quality and better than food grade nitric acid (made and stored in 100% glass on glass apparatus) is used to dissolve the selenium into ionic form. The recipe to make this stock is 10g of ultra pure selenium is dissolved in an ounce of roughly 20% concentration ultra pure nitric acid. This is serious stuff and probably should not be bought by households with children unless this is put under lock and key. Just a small sip of this stock can do serious damage and probably cause toenails to fall off and other symptoms of selenium overdose. In case of overdose take corrective measures and/or get help immediately.